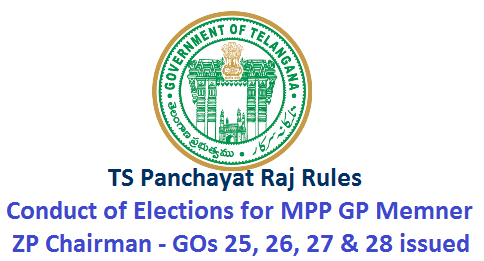 GO MS NO 25 Dated 19.05.2018 Panchayat Raj Department of Telangana RULES-Telangana Panchayat Raj(Conduct of Elections of Upa-Sarpanch of Gram Panchayat)Rules,2018-Issued. The appended Notification will be published in extra ordinary issue of the Telangana Gazette. GO MS No 26 Dated 19.05.2018 Panchayat Raj Department of Telangana RULES-Telangan Panchayat Raj(Preparation and Publication of Electoral Rolls)Rules,2018-Rules-Issued. The appended Notification will be published in extra ordinary issue of the Telangana Gazette. GO MS No 27 Dated 19.05.2018 Panchayat Raj Department of Telangana RULES-Rules relating to conduct of election of Member(Co-pted)President and Vice- President of Mandal Praja Parishad and Members(Co-opted)Chairperson and Vice- Chairperson of Zilla Praja Parishad-Rules-Issued. The appended Notification will be published in extra ordinary issue of the Telangana Gazette. GO SM No 28 Dated 19.05.2018 Panchayat Raj Department of Telangana RULES-Telangana Panchayat Raj(Conduct of Elections)Rules,2018-Issued. The appended Notification will be published in extra ordinary issue of the Telangana Gazette.